This article is an abbreviated version of the conference Poster Session entitled Great Circles, an Expanding Earth & Previously Unseen Crustal Shifting. A poster session was chosen so that more graphics could be used and interested individuals could be talked with at length. Two myths are here challenged, and a new discovery presented. Complements are made to the conference organizers for choosing such a mind opening theme. Challenging our unproven but deeply held beliefs is nearly impossible but leads to broader insights. General Premise of Paper: The first myth challenged is that oil and gas are fossil fuels. The work of C.W. Hunt, T. Gold and the observations of D. Mendeleev (and others) is that the precursors form deep within the earth and that Methane (CH4) rises and is altered by sub-surface microbial life. It is then trapped into reservoirs in the accepted fashion. The second myth challenged is the untested assumption that the earth is of constant size. It has only been accurately measured but once. The work of Hilgenberg, Vogel, Maxlow, Endersbee, and especially SW Carey (and others) develop the theory of an expanding earth from perhaps 50% of today’s radius in the last 200 million years. The new discovery shows that during expansion, the earth’s continental features reflect that expansion stress by altering their shape. 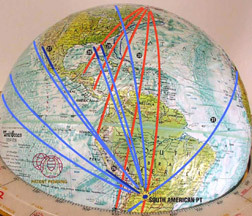 Great circles plotted on a globe indicate that there are 5 specific Lat/Long locations that focus (and direct?) these stresses. Plotting major oil and gas fields on a globe indicates that these major fields also align with these five points, and thus the expansion. Plotting Great Circles from these major fields — back to these 5 points — appears to inexpensively improve the probability of finding new undiscovered major fields. 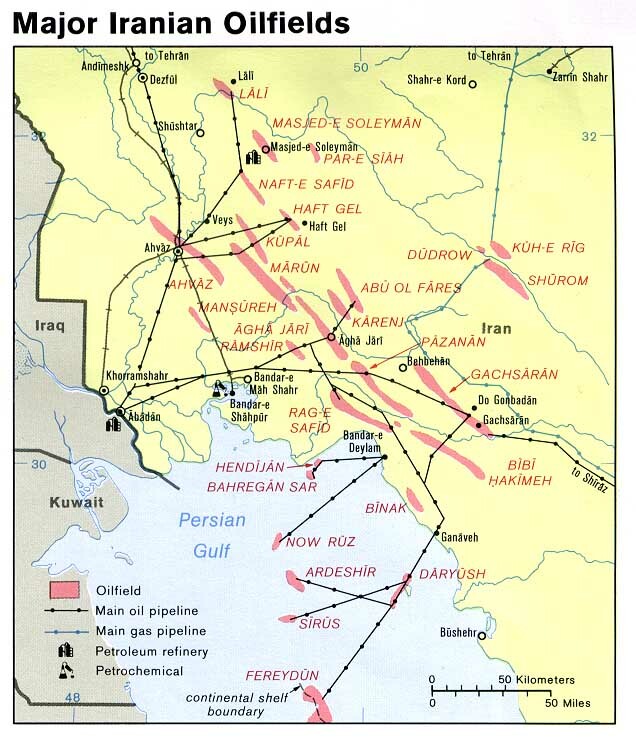 Much oil and gas has been found by following what has been called “closeology”, i.e. drilling near discovered fields. This article uses that principle in two ways: 1) Macro: using the global location of giant fields to direct towards others, and 2) Micro: using the shape of current fields to direct towards others. 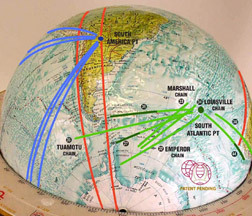 Gaining Perspective on method: Plotting on a globe is mandatory. Any flat map presentation severely distorts earth features and makes the alignments un-recognizable. Fig. 1 shows red lines converging on a point on the globe south of Australia. This point is designated the Australia Pt. Those red lines are Great Circles drawn on major earth structures which in this case are the east and west coast and Cape York of Australia and the south island of New Zealand. Not fully visible in the picture are red alignment lines to the north islands of Japan and the Kamchatka peninsula. 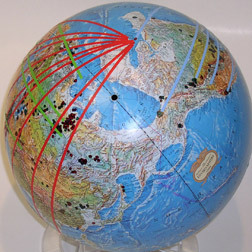 It will be shown that these red GC’s also connect to their antipode point – the Greenland Pt. The shorter blue lines are alignments before GC’s are drawn on them. 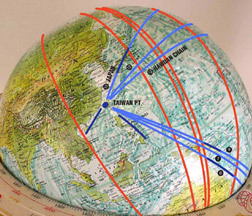 These blue lines (and many others) are shown to connect to the Taiwan Pt.and its antipode point – the South America Pt. Fig. 2 Continues the above GC’s red lines of Fig. 1 until they reconnect in the antipodal point – the Greenland Pt. 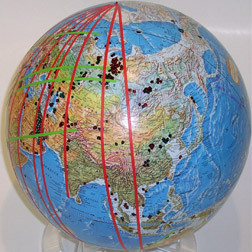 This figure shows numerous other GC red lines from a number of other straight line features of the earth. Some of the more prominent ones are the peninsula of Italy, the alignments of the Red Sea and the Persian Gulf, the west coast of India, and the west coast of South America. 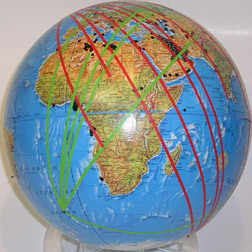 Alignments can be seen to be from all regions of the earth. These alignments cannot be seen on flat maps. Fig. 3 identifies the Taiwan Point. Fig. 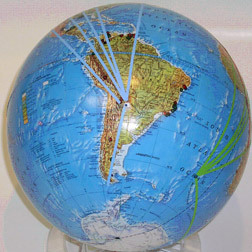 4 below locates the South America Point. Fig. 5 below locates the South Atlantic Point. Major Field Alignments: The following work plots the known 932 Oil and Gas Giant fields (≥500+ Million Barrels) onto a globe. Much thanks to Paul Mann, M.K.Horn and I. Cross from the Jackson School of Geosciences for their excellent work and for placing it in the public domain. 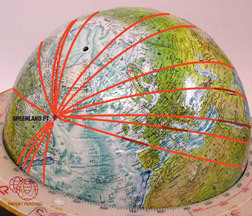 Since a Mercator projection (or any flat map) grossly distorts relationships, the data was transferred to a standard 12″ (30cm) relief globe where accurate great circles can be drawn. Red Circles = Gas Giants, Green = Oil Giants. It is suggested that GC’s drawn through many major fields and the marked 5 Primary Points show a useful correlation, which is likely predictive. Fig. 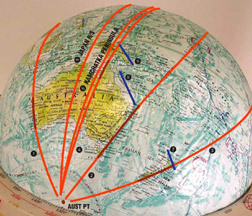 7 and 8 show how a narrow band of Red GC’s that connect the Australia and Greenland Pts., and show alignment with a number of the Giant Fields also marked on the globe. 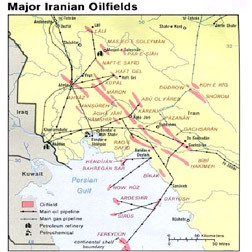 Of particular note are the Mideast fields around the Persian Gulf, and the Russian Fields (which also align with the formation structure of Thailand/Indonesia). If the Persian Gulf alignments were followed into the North Sea (not shown) those major fields also are bracketed by the same GC’s. One will note that Green GC’s to the South Atlantic Pt. are also visible in Fig. 7, 8, 9, & 10. Fig 11, 12 , & 13 focus on the straight line shape of the fields, apparently following the stretching apart due to the proposed force lines (expansion) stretching. Relief map Fig. 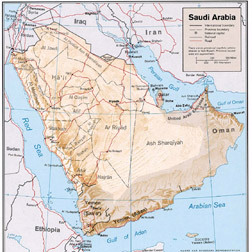 14 indicates Saudi Arabia has a 90º bend in structure from NW/SE to NE/SW due to long term stretching stresses. This can be seen in the location and structure of the giant Ghawar field. 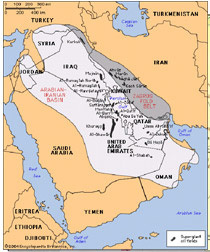 Note that Qatar parallels Ghawar’s linear structure and was apparently pulled away from the Bahrain Island structure shown in Fig. 13. Fig. 15 plots in close up the Middle East wells. Fig. 16 then plots the red and green GC’s to the designated points ofGreenland/Australia and South Atlantic to show the similarity of alignment. Do the fields in North and South America show a similar pattern? Here the alignments are to the Blue GC’s of the South America Pt. (and its antipode Taiwan Pt.) There are alignments through the Alaskan and Canadian fields. Alignments through the California, Texas and Louisiana Gulf Coast fields. Alignments through the Venezuelan fields. Space does not allow for the specific enlarged views of individual wells and fields that also show that the shape of certain fields gives direction towards other fields when connected with great circles to the 5 key points. 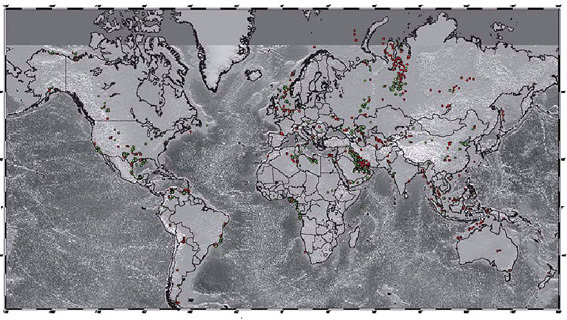 The author believes that the technique is predictive to unexplored areas near other fields and in areas where hydrocarbons are not expected. Myths, assumptions, and deeply held beliefs are not easily abandoned. Apparently heretical alterative hypothesis are not readily accepted, nor even made visible through the peer review filter. However, when billions of dollars and hundreds of thousands of man years of effort are at stake, perhaps some will find it useful to spend several hundreds of dollars and tens of hours of time to trace the route of great circles from one giant field to other undiscovered fields. If new oil or gas is found where it wasn’t expected, then perhaps renewed interest may be shown in the ideas of earth expansion, the non-fossil source of Oil and Gas, and the value of Great Circle Plots. Carey, S.W., 1983: The Expanding Earth – A Symposium. Earth Resources Foundation, Sydney, Aus., February 10-14, 1981, University of Tasmania, Impact Printing Ltd., Brunswick. Carey, S.W., 1988: Theories of the Earth and Universe – A History of Dogma in the Earth Sciences. Stanford University Press, Stanford, California. Endersbee, L. 2005: A Voyage of Discovery. An earthshaking revelation of what is happening to our planet. Monash Print Services, Monash University. Fig. 13. 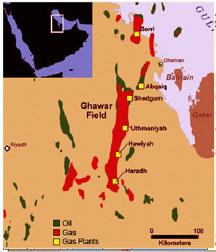 Ghawar Super Giant, from: Energy and Capital, Has Ghawar Peaked? Maxlow, J., 2005: Terra non Firma Earth. Plate Tectonics is a Myth. Terrella Press, Perth, Western Australia. Wilson, K.P., “Great Circles, An Expanding Earth and Previously Unseen Crustal Shifting”, Poster session November 20, 2007, at the 2007 “Challenge Our Myths”, American Association of Petroleum Geologists, European Region Energy Conference, Athens, Greece. 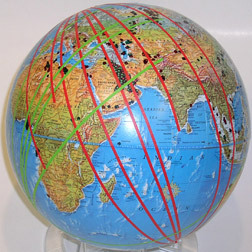 Wilson, K.P., 2006: The Expanding Earth Theory, The Expanding Earth Knowledge Co.
Wilson, K.P., 2007: US Patent # 7,207,802, Globes Having Marked Zones of Geographic Interest, The Expanding Earth Knowledge Co.
Wilson, K.P. 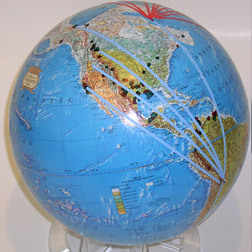 , 2007: US Patent #7,207,803, Earth Globe Assembly, The Expanding Earth Knowledge Co.